The AVH Series centrifugal pump is your solution to a lower cost of ownership while providing the flexibility your operations need. Its stainless steel construction provides the durability, integrity, and absolute quality required for your sanitary fluid transfer operations. AVH is available in 9 sizes: AVH-5, AVH-10, AVH-15, ANH-20, AVH-25, AVH-30, AVH-35, AVH-40, and AVH-45. Centrifugal pumps primarily consist of a stationary pump casing and an impeller mounted on a rotating shaft. The pump casing provides a pressure boundary for the pump and contains channels to properly direct the suction and discharge flow. The pump casing has suction and discharge ports for the main flow path of the pump and normally has small drain and vent fittings to remove gases trapped in the pump casing or to drain the pump casing for maintenance. The series meets the most stringent sanitary standards for being CIP-able and SIP-able. The AVH pump is equipped with either an external single shaft seal or a flushed shaft seal. The stationary seal rings are made up of acid resistant steel AISI 316L and silicon-carbide. The rotary seal rings are in graphite. 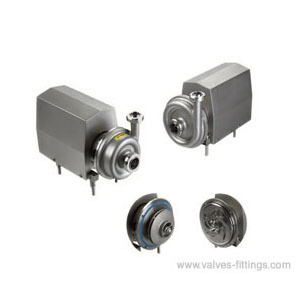 The pump also can be equipped with a double mechanical shaft seal. IEC B34 motors, IP55, F-class insulation, 50Hz or 60Hz.